A lot has changed in my household since becoming a mom a little over a year ago. There is one thing that hasn't though: Putting delicious and healthy dinners on the table for my family every night is still one of my top priorities. What has changed is that after a long day at the office and an evening of tending to family matters, spending a ton of time making dinner in a hot kitchen on a steamy July night is about the last thing I feel like doing. And that's where my friends at Jewel-Osco and Gold Peak® have come to my rescue this summer! 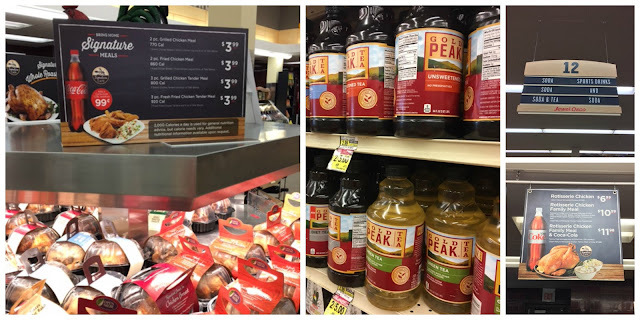 I live just a few blocks away from a Jewel-Osco grocery store, so I find myself there often: Doing a big weekly shopping trip and then stopping in between for last minute items -- like dinner essentials, when I don't feel like cooking! And with that in mind, Jewel's Signature Meal Deals are a weeknight go to. I love the versatility of rotisserie chicken-- this chicken has the best flavor, it's super moist, and you can turn it into a sandwich, tacos, chicken salad, add it to pasta salad (scroll on down for my recipe! ), or serve it as is, of course! 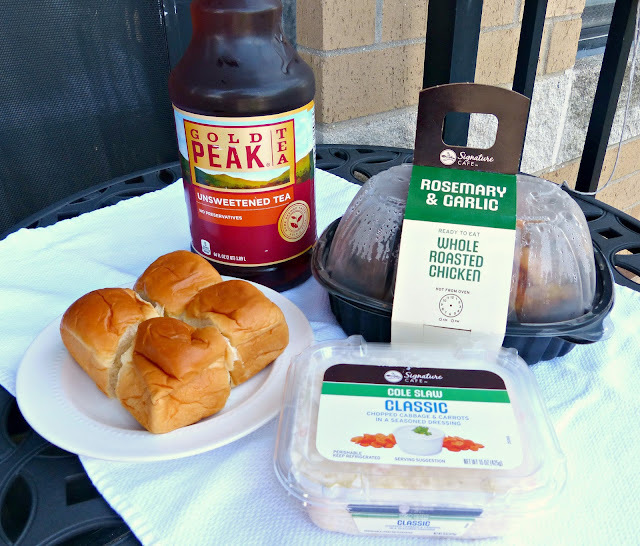 Rotisserie chicken is also part of the Jewel-Osco signature meal deal, so you can pick up a whole roasted chicken, 2 side dishes (like classic cole slaw! ), and Hawaiian rolls and dinner is ready! It's a great value, but even better when you add a refreshing beverage to the mix. I'm partial to an iced Gold Peak tea in the summertime, while my husband is a Coca-Cola™ man all the way. The great news is that you can add a Gold Peak tea or a Coca-Cola to your signature meal for just $0.99. It's an easy way for us to get dinner on the table and have some time together without cooking or cleaning the kitchen. It's nice to have a few extra minutes to linger over a cool beverage together during a summer night! And speaking of summer nights, one of my favorite dishes to make for dinner at this time of year is a pasta salad. It's a one-dish dinner that is totally customizable, can feed a crowd (or yield leftovers for lunch later in the week), and because I use a fully cooked rotisserie chicken, it requires very minimal cooking! 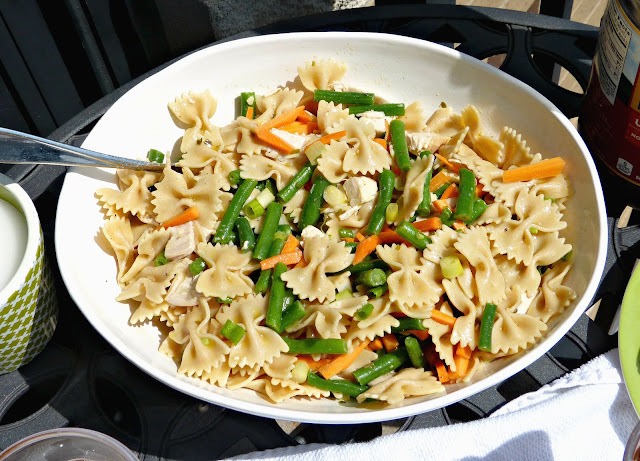 This recipe starts with whole grain pasta and then I add season vegetables (in this case, green beans, carrots, and green onions), and cubed rosemary garlic rotisserie chicken. It's all tossed in a delicious homemade lemon tea vinaigrette made with fresh lemon juice and Gold Peak tea. 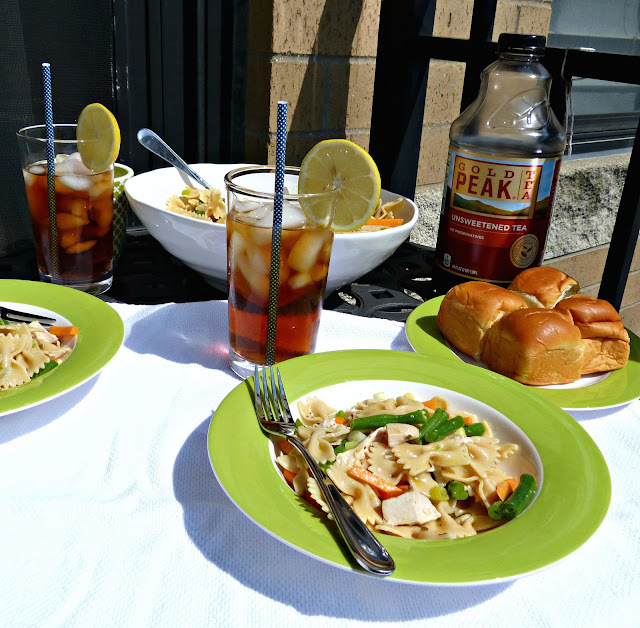 The Gold Peak tea adds a little unexpected earthy flavor to the tangy lemony vinaigrette. And everyone knows that Gold Peak iced tea pairs perfectly with chicken, so the idea of a cold glass of iced tea plus bowl of roasted chicken pasta salad just tastes like summertime to me. 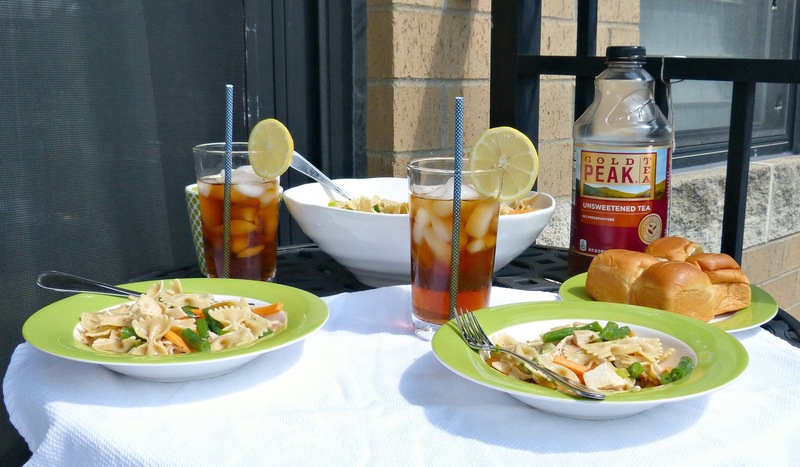 Gold Peak tea and this chicken pasta salad definitely make for a perfect dinner match... but let's be real, Gold Peak tea and Coca-Cola products go well with just about any meal! In case you're looking for more summer mealtime pairings though, Coca-Cola has shared some other great ideas for dishes to pair with your favorite Coca-Cola brand beverages. Get a delicious and refreshing dinner on the table fast this summer with Gold Peak tea and Jewel-Osco signature meals. Summer is too short to spend standing over a stove when you should be enjoying it with friends, family, and a great meal instead! With 3 minutes left of pasta cook time, add the cut green beans to the boiling pasta pot. Cook and drain well, rinsing well with cold water to prevent further cooking. Add the pasta, green beans, chicken, carrots, and green onion to a large bowl. Set aside. In a small bowl or cruet, whisk tea, honey, mustard, lemon juice, vinegar, chives, salt and pepper together until fully combined. Slowly stream in the oil, whisking constantly to incorporate. Pour 1/2 cup of dressing over the pasta mixture and toss to combine. Serve or cover and refrigerate until ready to serve. Taste the pasta before serving and dress with reserved vinaigrette, if needed. Bannerizer made it easy for you to promote ClickBank products with banners, simply go to Bannerizer, and get the banner codes for your picked ClickBank products or use the Universal ClickBank Banner Rotator Tool to promote all of the ClickBank products.